If you’ve never barbecued a whole bird, you’re missing out on a treat! This is one of the most incredible BBQ chicken recipes you’ll ever come across and could just change the way you look at BBQ chicken for life! It’s brilliantly versatile and allows for all the experimentation in the world – combine with your favourite BBQ sauce recipes and you’re onto a guaranteed winner! And just in case you wondered, the answer is no…it’s neither complicated nor messy to get done! 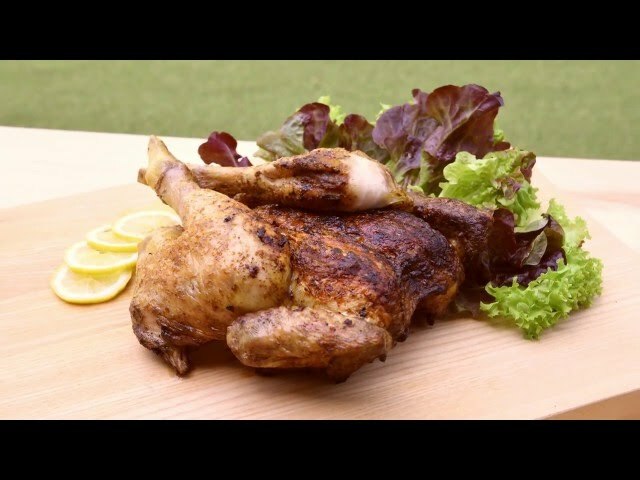 Place the whole chicken on a wooden or plastic cutting board, breast-side-down. Take a pair of strong scissors and cut out the backbone. You’ll need to make a cut down each side of the backbone, starting at the cavity and cutting straight through the rib bones all the way to the end. Turn the chicken over so the breast is now facing up. Flatten the breastbone by pressing down on the centre of the chicken with the heel of your hand, while opening the bottom of the chicken up as you press down. The whole chicken should now be flat. In a small bowl, mix together a good glug of olive oil with paprika, lemon juice and chopped garlic to taste. Feel free to add your own favourite herbs and spices at this stage, if you like. Brush the skin of the chicken generously with the marinade, making sure it’s all nicely covered. Place the chicken breast-side-up on a hot barbecue and either close the lid or turn the chicken over every few minutes. Continue basting with the marinade regularly for maximum flavour. Cook for approximately 50 minutes, or until the internal core temperature of the chicken reaches 75°C.